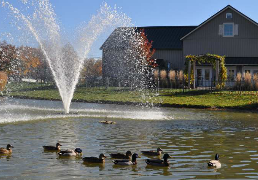 Upper Arlington, Ohio is a suburban city of approximately 34,000 residents, situated on the northwest side of the Columbus metropolitan area. It was created out of former farm land by real estate developers, Ben and King Thompson in 1913, and was incorporated as a village in 1918. Upper Arlington became a city in 1941, and through several annexations over the ensuing two decades, doubled its size to its present 9.87 square miles. Upper Arlington is a well-established community with a combination of older, historic homes, many of which are situated in the southern half of the city, sometimes referred to as the “Upper Arlington Historic District,” or simply, “Old Arlington,” and newer, ranch-style houses, north of Lane Avenue, that were built during the post World War II housing boom. Housing prices in Upper Arlington are generally higher than those in neighboring areas, which explains why its most prevalent population group is between 50 and 64 years of age. In addition, because of its proximity to Ohio State University, the city is home to many professors and other middle-aged workers who commute daily to Columbus. passing what she refers to as “a complete street policy.” She explains: “Any major roadway construction projects we now undertake must also include accommodations for bicycles, pedestrians, and transit.” That mandate has informed the city’s upcoming Tremont Road construction project, a major infrastructure undertaking, which is slated to begin its first phase, this July. Of course, being an Ohio city, Thiel admits that its location poses certain challenges: “The climate, the freeze/thaw cycle is very harsh on our infrastructure. So, we have to pay very close attention to construction methods used, to insure that the quality of the work will hold up to our climate.” In 2014, Thiel’s Department of Engineering did just that when it completed construction on a roundabout near the Ohio State campus. The roadway was re-constructed using roller-compacted concrete, a method of construction that earned the city an award. Some of the city’s other infrastructure repairs will be the result of a mandate from the Ohio Environmental Protection Agency. The city of Columbus, and the 22 satellite cities around it, all have orders from the Ohio EPA to study their sanitary sewers, and then design and implement improvements to them. So Upper Arlington has a 10-year CIP (Capital Improvement Project) program in place. Luckily, the city’s budget for infrastructure improvement has increased from $5-6 million to $10-13 million, per year. 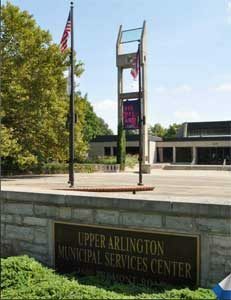 As the city of Upper Arlington closes the book on its first century, it’s apparent that all the hard work put in by the members of its Engineering Department, combined with the enthusiasm (and generosity) of it inhabitant’s, will guarantee a bright future for this Ohio city’s next hundred years.